A week ago today, a small town was burning and I was sitting at my desk, writing a story that opened thus: “I spent several days in Coligny, but let me start by admitting that my expertise is slender and my knowledge of what happened there full of gaping holes. On the other hand, history is accelerating at a frightening rate, and I fear that anything I have to say might be meaningless if I don’t say it now.” That paragraph didn’t make it into the final draft, which you can read here in its entirety. 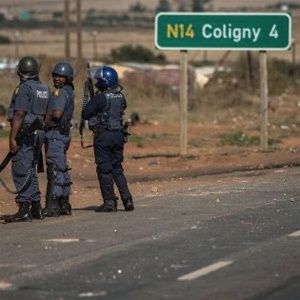 As you will see, my story notes that the case against two whites accused of beating 16-year-old Matlhomola Mosweu to death remains unproven, and goes on to dissect the rioting that followed from the perspective of its victims – local whites and Indians, or foreigner traders burned out of their shops in Coligny’s satellite township. This inevitably offended readers who felt I’d paid scant attention to the grievances of the town’s black community. This is true, but then again, it was not my purpose to provide alibis for the rioters; many other journalists had done that already, and besides, I had another message to deliver, one that upset certain activists and intellectuals. Mesdames, you are both absolutely right: I am paranoid, and I must thank you for moving this discussion to the terrain where it belongs – the national psyche in general, and my own state of mind in particular. If you don’t recognise those quotes, feel free to Google the sources. And if you think they aren’t sinister, replace the term whites with “Jews” and see what they call to mind. So yes, I am paranoid. Most mornings, I wake up feeling like a Jew trapped in Nazi Germany circa 1938, trying to convince myself that most Germans are nice people and that the extremists can’t possibly mean what they say. Some friends say, ah, stop worrying, it’s just demagogues angling desperately for support they won’t get. Others urge me to listen to dissenting voices like Thuli Madonsela’s, who is disturbed by the whiff of Hutuism in the air but stops short of predicting apocalypse. Finally, there is much solace to be found in opinion surveys which invariably show that the vast majority of black and white South Africans have no serious problems with one another and want above all for the races to work together. These palliatives work for a while, but when blacks started burning white homes in Coligny, the darkness came crashing in again. I thought, it’s just a matter of time before the mob arrives on my own doorstep, best buy some mace and night vision goggles so I can at least see the black radicals coming for me. Msimang is right to say that I went to Coligny with a preconceived agenda, but it was not the one she imagines. I went there to confront demons, my own as well as the nation’s. I was particularly keen to explore the link (if any) between extremist rhetoric and the summoning-up of a demonstration that soon lost its moral focus and degenerated into looting. In this I failed hopelessly. Couldn’t even identify the organisers of Coligny’s supposed slave revolt, let alone ask which political faction they answer to. So I came home to write an opinion piece highlighting aspects of the drama previously underplayed by journalists, and presenting some arguments that Falkof and Msimang found highly offensive. They accuse me variously of trivialising Mosweu’s death, replicating apartheid tropes about white innocence and black savagery, and promoting a “politics of fear” that “polarises and isolates” and further inflames our already psychotic society. It’s strong stuff. You should read it. Some of it is fair comment, some less so, but at least we’re talking about the unspeakable instead of ignoring it. Msimang’s contribution is particularly searing, and she really nails me towards the end. “This article is one in a long line of pieces Malan has authored that showcase both his gift for prose and his increasingly paranoid, bleak and analytically tepid thesis that South Africa is paradise lost; a ruined country where the inexorable slide towards Zimbabwe – that signifier of all the horrors of African independence – may soon be unstoppable.” She’s dead right. That’s exactly how I see things. In this, she relies heavily on Shenaaz Jamal, a TimesLive reporter who exposed allegedly racist practices by some white shop-owners in Coligny’s business district. That’s another contested story but there’s no space for details here, so I’ll just note that Msimang is remiss in attributing Jamal's alleged mistreatment to blackness, because Jamal is Indian. (Sorry to draw apartheid-era distinctions, but the new politics is reducing all of us to barbarism.) Soon as I heard that there were Indians in Coligny, I sought them out, thinking that since they were neither Boer nor black, their perceptions were less likely to be contaminated by blind loyalty to one side or the other. If Jamal had done the same, she would have met Afrikaans-speaking Indians who said, “Ag, the Boers are okay,” or, “Never happened to me” – this in response to Jamal’s claims regarding separate queues for races at Coligny’s OK Supermarket. She might even have found herself taking tea with a dignified Muslim elder and his white Afrikaans wife, recently united in holy matrimony in their late seventies. If Coligny is really “trapped in an apartheid time-warp,” as Jamal claims, the plot surely called for this couple to be run out of town by white racists. Instead, they were set to flight by blacks who burned down their neighbour’s house. Why am I telling you this? Just to underline a brutal irony. If Coligny was really an expression of inchoate rage against injustice and white racism, as my detractors claim, how come the vast majority of its victims were Asian? And I do. It must be unbearable for blacks to live with the fact that their household incomes are still one-fifth of the white average, 23 years into majority rule. But I think some politicians are selling a snake-oil solution. The primary cause of inequality in South Africa is rampant black unemployment, not white selfishness. Extremists who say otherwise put whites in an impossible position, damning us for inequality while at the same time denying us any chance of ameliorating it by creating jobs. I mean, what else are white capitalists good for? Msimang and Falkof have misconstrued my concluding argument in this regard, so let me repeat it in slightly amended form. Brothers and comrades, burning the country to cleanse it of “whiteness” is not the wisest idea. We should rather follow the truly revolutionary path of Deng Tsaio Ping, who set forth in 1978 to “seek truth from facts” and deliver Communist China from its misery and backwardness. His first move was to free peasants from the yoke of collectivism and allow them to work in their own interest, which to say, if you worked harder and grew more tomatoes than lazy me, you were entitled to pocket the profits and spend them on your own family. This was the genesis of a peculiarly Chinese form of free enterprise. Four decades later, China’s economy is the world’s largest, and Chinese people have experienced a happiness explosion unparalleled in human history. With discipline and courage, we could achieve something similar. I struggle to see how killing white farmers, engineers and scientists will help, but if extremists want to try, there is nothing I can do about it save utter a warning. My handle is @DeadWhiteMan2 and you have heard from me. - Rian Malan is a writer who does not tweet. He tried it once, found it impossible to say anything coherent in 140 characters and gave up.